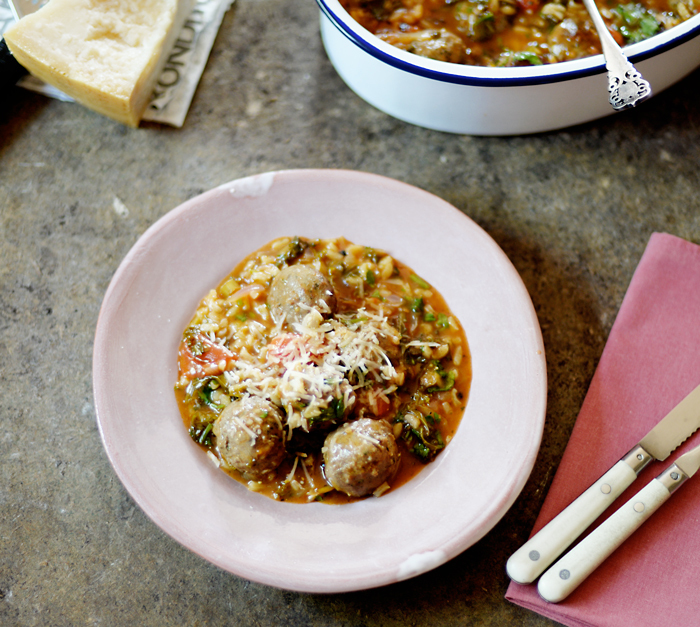 Lemon & Vanilla: Baked risotto with beef meatballs and curly kale / Risotto no forno, com almôndegas e couve kale. 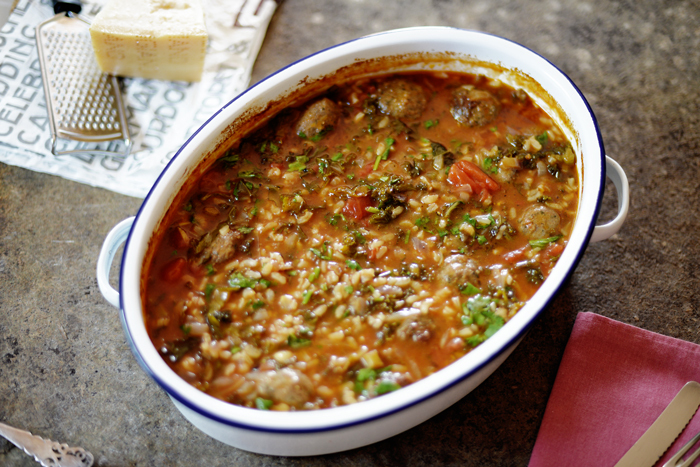 Baked risotto with beef meatballs and curly kale / Risotto no forno, com almôndegas e couve kale. This fabulous risotto was inspired by this Emilie Raffa recipe. I've already made the original recipe once, with the chicken sausage, and I posted the photo here on my instagram account. The thing is, if I made it again, it's not difficult for you to guess how fantastic and delicious it is, right? As I wrote above, the first time, I made it with the sausages like it is described by Emilie. This time, I had some meatballs in the fridge and I didn't want to make them with pasta so, looking at a bag of leftover curly kale that needed to be used, I straightaway thought of making Emilie's baked risotto again but, using those two ingredients. The result couldn't be more delightful and the combination, absolutely delicious!! In a large cast iron pan, or another oven proof pot with lid, warm the olive oil over medium heat. Add the meatballs and brown for about 10 minutes, on all sides. Transfer the meatballs to a plate and set aside. Pour out any residual oil and clean the bottom of the pot with a paper towel. Add the other tablespoon of olive oil and the butter to the saucepan. Add the onions, celery, and garlic and sauté over a medium low heat, until the vegetables begin to soften. Add the rice and stir for about 1 minute, or until the grains are well coated. Deglaze the pan with a splash of white wine, scraping up any brown bits stuck to the bottom of the pot. Simmer for 1 to 2 minutes, or until the wine is slightly reduced. Add the tomatoes and stock, and give it a stir. Bring to the boil and add the kale. Place the lid on top and transfer to the oven. Bake for 30 minutes. At the 30 minute mark, add the meatballs and continue to bake for an additional 10 minutes. The risotto is ready when the grains are tender, but still have a slight bite to them. Remove the pot from the oven and have a peek. Adjust consistency with more stock or simply keep it the way it is. Taste and season with salt and pepper. Stir in the chopped parsley and serve warm, topped with gated parmesan cheese to taste. Deixo-vos hoje este risotto magnífico, super delicioso e feito no forno. Ou seja, não têm de estar 20 minutos encostadas ao fogão a mexer constantemente. A receita é esta aqui, da Emilie Raffa e, embora eu já tenha feito a versão original, com salsichas frescas, como descrita no blogue da Emilie, da qual publiquei a foto aqui no meu instagram, hoje deixo-vos a receita que fiz pela segunda vez, desta feita, com almôndegas e couve kale. Pelo descrito acima, poderão concluir o quão bom que é este risotto, pois se o repeti, embora com uma adaptação de ingredientes, é porque vale mesmo a pena certo? Tinha almôndegas em casa e não me apetecia fazê-las da forma tradicional e então, olhando para um saco com um resto de kale que estava no frigorífico, decidi imediatamente que iria fazer este risotto divino, utilizando estes dois ingredientes e assim o fiz. O resultado final? Honestamente? Não podia ser mais delicioso e, garanto-vos, este risotto presta-se às mais inúmeras combinações, pois as hipóteses são imensas, a imaginação é o limite e o resultado final e sorrisos de satisfação à mesa, serão sempre positivos. Num tacho com tampa e que possa ir ao forno, aquecer 1 colher de sopa de azeite sobre lume médio. Adicionar as almôndegas e fritar de todos os lados, até estas estarem bem douradinhas. Cerca de 10 minutos. Transferir as almôndegas para um prato e reservar. Limpar o fundo do tacho com papel absorvente de cozinha e, sobre lume médio a baixo, aquecer a segunda colher de sopa de azeite e a manteiga. Adicionar a cebola, o aipo e os alhos e refogar até estes estarem macios. Adicionar o arroz e fritar por 1 minuto, ou até os grãos estarem bem envolvidos na mistura anterior. Adicionar o vinho branco e deixar reduzir por 1 ou 2 minutos, raspando bem o fundo do tacho com uma espátula, a fim de soltar os resíduos caramelizados que se colaram ao fundo. Adicionar o tomate e o caldo e mexer tudo muito bem. Deixar levantar fervura e adicionar a couve. Tapar o tacho e colocá-lo no forno. Cozer o risotto no forno por cerca de 30 minutos. Passados 30 minutos, retirar o tacho do forno, adicionar as almôndegas, mexer, voltar a tapar o tacho e levar ao forno por mais 10 minutos. Quando pronto, o arroz deverá estar cozido, mas al dente. Retirar o tacho do forno e, caso achem necessário, adicionem mais um bocadinho de caldo, para que a consistência fique ao vosso gosto (eu não precisei e podem constatar o caldoso que ficou). Rectificar os temperos e adicionar mais sal e pimenta, caso achem necessário. Adicionar a salsa picada e servir quente, polvilhado com o queijo parmesão ralado. Recipe (adapted) / Receita (adaptada): The Clever Carrot blog. 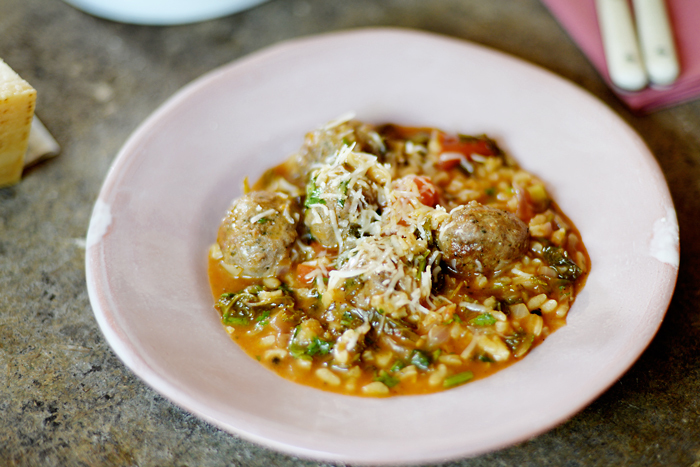 Etiquetas: Emilie Raffa., Kale / Couve., Meatballs / Almôndegas., Parsley / Salsa., Risotto., Tomatoes / Tomates.